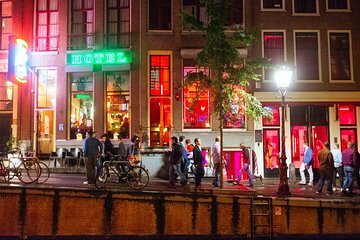 Entdecken Sie während dieser 1,5-stündigen Nachtwanderung das pulsierende Nachtleben, die legendären Cafés und den berühmten Ruf des berühmten Rotlichtviertels von Amsterdam. Schlängeln Sie sich durch die Straßen von Amsterdams berühmtester Nachbarschaft und umarmen Sie das Seltsame, Wunderbare und Verrückte! Sehen Sie auf dem Weg Kuriositäten wie den ersten Kondomladen der Welt und das Prostitutionsmuseum. durch buntes Chinatown weben; und fotografieren Sie die malerischen Kanalwege von Amsterdam. Loved our late night walking tour. Our guide was fun, data driven, and knowledgeable about the area and the history behind the Red Light District. Great eye opening experience for an area of Amsterdam that I think is highly misunderstood. Cannot recommend this tour enough! 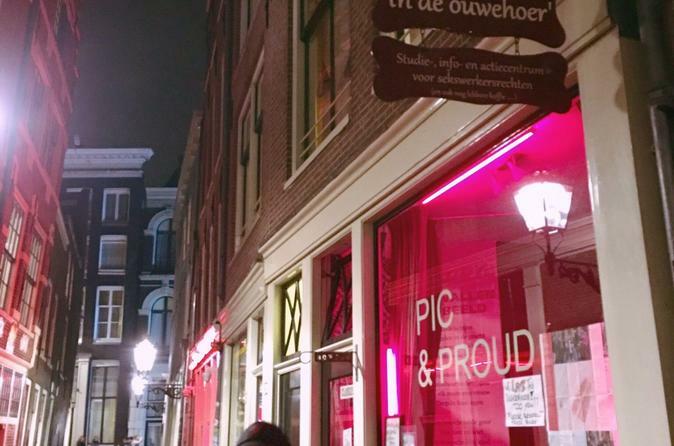 We had a great time on this tour, this is a must do in Amsterdam. Our guide was excellent an introduced to things we did not know. I would highly recommend this tour just for the understanding of the district. The dozen of us had a good time led by Mark, who had first hand knowledge of the District, having met his wife there. A cold night on some crowded streets but saw many good aspects o f the neighborhood. Learned so much more than if I went on my own. Salty but made us feel safe and well cared for. Well worth doing this Tour. Our guide, Arthur, was very informative and funny with it. Took us places we wouldn't have ventured on our own! I found this tour was great for me being a solo traveller. Martin was a great guide and passionate about his city and its history. We went on a Saturday night so there were a lot of people can’t imagine what it would be like during high season.Our guide was very knowledgeable and had such enthusiasm for his hometown. He explained how the girls are unionized, safe, get a pension and pay taxes.Worth doing, wish the group was a bit smaller but otherwise ok. The tour was an eye opener and very good, except for the unpredictable rain. The group could have been smaller. Saturday nights, the streets are mobbed, so dodging people and rain made the experience stressful, but the overall experience was very good. I would strongly recommend it.